* 60-inch HD LED TV in main level, 42-inch HD LED TV in upper master bedroom, 40 inch HD LCD TV in second upper level bedroom, 32-inch HD LED TV in lower master bedroom, all four TVs with Roku streaming video with Hulu Live TV subscription. The location is conveniently situated 1.5 miles from either Rehoboth Beach and its boardwalk or the ever active Dewey Beach area (during peak season). This home is 2 miles away from the Tanger Outlets, which prides itself of more than 100 stores, open all year-round for totally tax-free shopping experience. Please contact us for more information and images of this beautiful place. This property is very well maintained by the owners. It will be rented out to individuals and groups that will guarantee keep it in its good condition. Due to safety reasons, we limit occupancy to 6 people only please. Contact the owner for more details. 3 additional parking passes for the Bella Vista community is provided. Parking is on a first come first served basis. Wi-fi is provided free of charge. 60 inch LED TV in main level. All bedrooms have either an LED or LCD TV. Streaming Video is provided using Roku streaming in all TVs. Subscription to Hulu Live TV package is included. The premium amenities offered: * 34 channels of High definition (HD) cable including HD SHowtime and HBO in all bedrooms. * 60-inch HD LED TV in main level, 42-inch HD LED TV in upper master bedroom, 40 inch HD LCD TV in second upper level bedroom, 32-inch HD LED TV in lower master bedroom, all four TVs with Roku streaming video with Hulu Live TV subscription. * computer with guest access and high speed internet * free Wi-Fi access * Blue Ray DVD player in main level * Ipod dock connected to the premium sound system * gas grill in rear patio Some of the basics included in your stay: * central A/C and heating * full-size washer/dryer * coffee maker with carafe * dishwasher * iron/ironing board * cooking utensils, flatware and dining ware * one-car garage with remote opener * beach chairs and umbrella We ask that renters provide their own linen (2 queen beds, 2 twin beds, 12 pillows, towels), and toiletries. It was very nice. However, the lower level was very cold. It was very clean and comfortable. Also, the location was very convenient for access to the beach and shopping, dining, etc. We have stayed in Rehoboth every summer for the past decade and this was by far our favorite rental. Everything was exactly as described and very clean! Well stocked kitchen with clean utensils in good shape (unlike most beach rentals). All appliances worked well and were in excellent condition. Great layout with 3 bedrooms each with their own bathroom. All rooms had working tvs with cable. Within walking distance to Big Fish Grill. 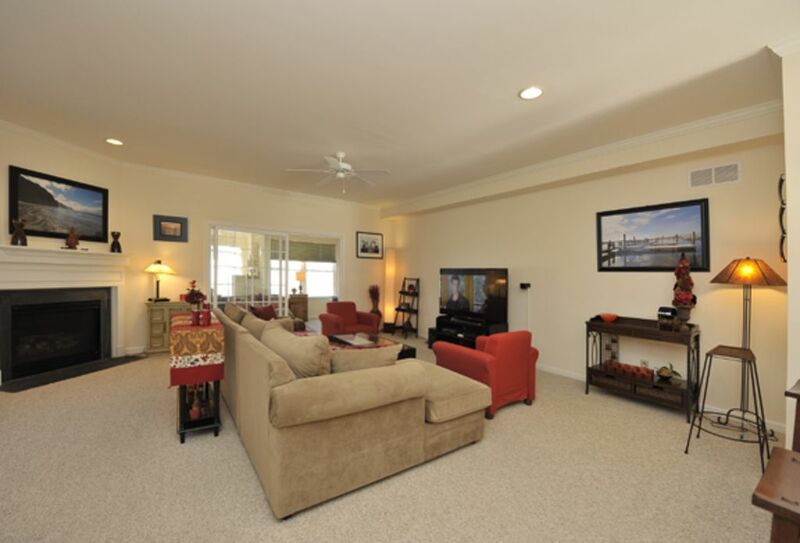 Short drive to the beach and downtown area or easy bike ride. We highly recommend. The place was clean and very comfortable for our family of 4. We liked parking our bikes in the garage and using the gas grill for dinner. The beach was only a short drive each day. We found parking for only $10/day at the beach. Place was well appointed with nice furnishings. I would just add a blender for those frozen drinks. We would stay again! We stayed for a week at George and Malou's townhouse with 7 people. The house accommodated everyone comfortably. The house is beautifully maintained and decorated, clean, and within a short drive to the beach and the outlets. George was quick to respond to all emails and we really enjoyed our stay. We would definitely stay there again. My family always travels to Rehoboth, DE for vacation and this year needed additional room as our family grew! I came across George's property and loved it! It did not disappoint! The set-up was perfect for our family & in-laws! Everything was clean, well maintained, and spacious. We loved our days at Tower Beach and nights cooking dinner on the grill and taking walks. Just added this one to my favorites! George was great to work with! He was responsive and took that extra mile to check in with us during the week. Definitely recommend this rental. Great quiet neighborhood and close to everything! Perfect home away from home. We had a wonderful time in this town home. The furnishings are beautiful. The property is clean and very well maintained. The layout works well for our family (4 adults and 2 small children.). The location is just a short drive to the beaches and shopping. The owners are excellent to work with and provide many amenities. This is our third stay and will continue to come back.